Our blend of experience, exceptional performance and value, has positioned VPI as the leading window & door supplier for mid-rise, multifamily and commercial markets in the Western United States. 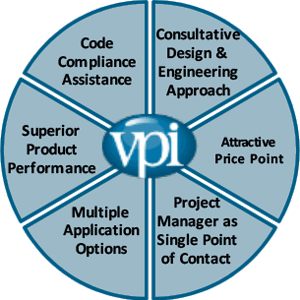 VPI consistently leads the industry in product innovation, capability and customer support. VPI is never satisfied with the status quo, we dedicate countless hours reviewing, revising and modifying our products and processes. Continuous improvement, process discipline and creating an environment where our employees are encouraged to share their ideas are mainstays of our corporate culture. Whether we are working with specifiers during the design phase or randomly selecting products for in-house water testing, VPI is committed to raising the bar. We recognize that performance is measured in many ways, including product longevity. We combine our superior fabrication processes with the best materials from vendors that share our commitment to quality and consistency. We proudly partner with the best, US based material partners in our industry. VPI’s broad product offering, exceptional product quality, and engineering-driven custom design and manufacturing capabilities uniquely position the company in the marketplace.